Summer Time Fun and Nationals Park Attendance Records! Summer is in full swing and with it has finally come some dry weather! I’ve been extremely busy around the DC area the past couple of weeks and simply haven’t found the time to update my blog! With that, I need to catch you all up on my latest adventures. On June 6th I attended the Global Race for the Cure which is an event to raise awareness of Breast Cancer that took place on the National Mall. I couldn’t believe my eyes when I arrived at the mall; there were over 55,000 people there! I was able to meet so many courageous cancer survivors and was happy to help out for such a great cause. Recently I attended a “Buzz-A-Thon” in Gaithersburg, Maryland where all proceeds of buzzed hair cuts were donated to the National Children’s Hospital’s Brain Tumor Institute. This Buzz-A-Thon was set up in the honor of Johnny Holliday’s grandson Jack. Being at this event, it was wonderful to see the community outreach for people needing of support. NatsTown was rocking this weekend as the Red Sox were in town. Throughout the three game series, we set a Nationals Park attendance record all three nights! It was great to see Nats fans at the park in full force. What made the series even better was being on top of “Nats Fans 10” waiving my Curly W flag signaling a hard fought victory! TEXAS, and More Fun Adventures! This past weekend I flew south to the great state of Texas where I helped Rangers’ Captain celebrate his birthday! Once in Texas, I got to meet up with a lot of my friends who came to party as well. 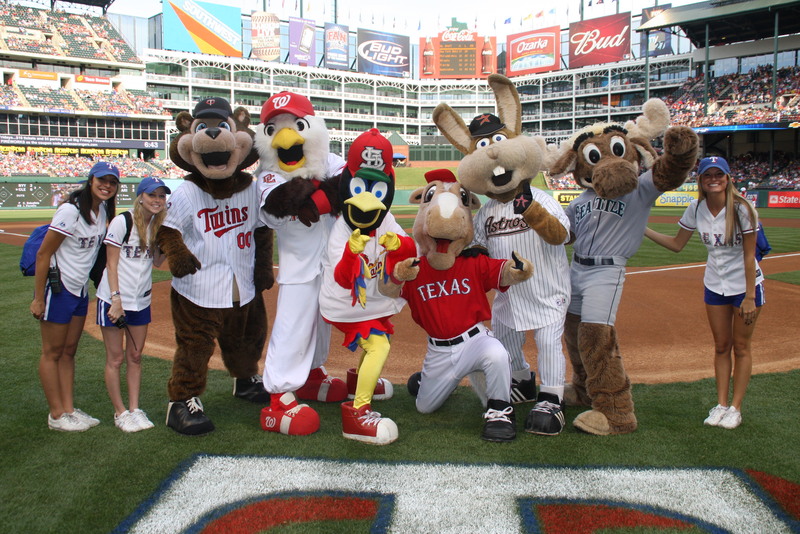 Fredbird, TC Bear, Mariner Moose and Junction Jack were there as well! The six of us partied hard with plenty of dance-offs, high-fives and hugs to all the fans at the park. It was great seeing a lot of my buddies again and can’t wait until we all meet up again in St. Louis for All-Star Game! The other day I visited the Children’s Nationals Medical Center, where I and the umpires from the game that night handed out teddy bears to children at the hospital. We all know that being in the hospital is never fun, especially as a kid. Therefore, it felt so great to make all of these children so happy, even for the small amount of time we spent with each child. On Saturday I spent my morning at the National Mall where the Global Race for the Cure was taking place. This event drew 55,000 people from across the world all who gathered to spread awareness and raise funds to battle breast cancer. I was able to meet some extremely resilient breast cancer survivors and was moved by the amount of people who took part. That was my past week, keep checking in as I update you on my future endeavors. Until next time, GO NATIONALS!! !